The 2012 Infantry Soldier Silver Dollar honors the infantry of the U.S. Army with designs emblematic of the branch on both the obverse and reverse of the coin. 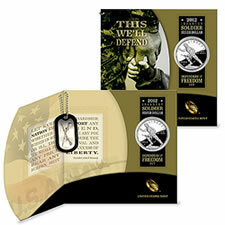 The U.S. Mint released Soldier Silver Dollar products consisting of a proof coin, an uncirculated coin and a 2012 Infantry Soldier Silver Dollar Defenders of Freedom Set on February 16, 2012. The set includes a proof dollar and a replica Army dog tag on a miniature chain, all packed within a descriptive folder. Each composed of 90% silver, the United States Mint will produce no more than 350,000 of the commemorative coins across all product options. While the Defenders of Freedom Set launched and will remain at a price of $51.95 until all 50,000 are claimed, the proof and uncirculated issues were released at introductory prices of $49.95 and $44.95. Regular pricing of $54.95 and $49.95 were designated to go into effect late in the day on March 19, 2012. The numismatic products are available from the U.S. Mint website at http://www.usmint.gov/catalog. The commemorative coins were authorized by Congress under the National Infantry Museum and Soldier Center Commemorative Coin Act (Public Law 110-357) with a purpose to… "require the Secretary of the Treasury to mint coins in commemoration of the legacy of the United States Army Infantry and the establishment of the National Infantry Museum and Soldier Center." This act was signed into law on October 8, 2008 by President George W. Bush. "For more than 200 years, our Infantry has defended our lives and our freedom, and no tribute can repay what these soldiers have given their fellow Americans," U.S. Rep. Lynn Westmoreland said. "The Infantry coin itself is part of our continuing efforts to honor those who served on the front lines for this nation, and sales of the coin will honor them in perpetuity by creating an endowment that will fund the maintenance of the National Infantry Museum at Fort Benning." As indicated by the name of the Act, its purpose and the comments of the sponsoring representative, the National Infantry Museum and Soldier Center will benefit from the sale of these coins. A surcharge of $10 per silver dollar will be collected by the US Mint. This surcharge will be forwarded to the National Infantry Foundation who is directed to use it for the purpose of establishing an endowment to support the maintenance of the museum and center. Shown on the obverse of the coin will be a depiction of a modern infantry soldier. Charging forward on rocky ground, the soldier is beckoning to fellow troops to follow which is emblematic of the "Follow Me" motto of the infantry. Surrounding the scene are the inscriptions of LIBERTY, IN GOD WE TRUST and 2012. The obverse was designed by Artistic Infusion Program (AIP) Master Designer Joel Iskowitz and sculpted by United States Mint Sculptor-Engraver Michael Gaudioso. The reverse shows the branch insignia of the infantry with two crossed rifles. Reverse inscriptions include UNITED STATES OF AMERICA, ONE DOLLAR and E PLURIBUS UNUM. It was designed by AIP designer Ronald D. Sanders and sculpted by United States Mint Sculptor-Engraver Norman E. Nemeth.